This window is part of the ADH model control dialog (ADH | Sediment Library Control... command). 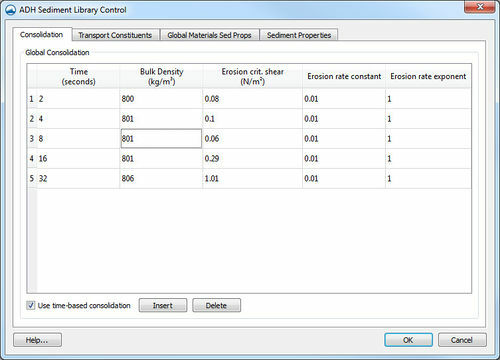 It is accessed from the ADH Sediment Library Control window by clicking on the Consolidation tab. The Consolidation tab consists of a table defining the properties of cohesive sediments included in an ADH simulation. The sediment classes must be specified before entering these time-based parameters for each sediment. The check box labeled Use time-based consolidation at the bottom of the page tells ADH that consolidation should be computed. Time (sec) – Measured in seconds. Bulk density (clay/silt type only) – Measured in kilograms per cubic meters. Erosion crit. shear (clay/silt type only) – Critical shear stress for erosion is used in the erosion flux equation. Measured in Newtons per square meters. Erosion rate constant (clay/silt type only) – Used in the erosion flux equation. Erosion rate exponent (clay/silt type only) – Used in the erosion flux equation. All value fields are restricted to positive non-zero real numbers unless stated otherwise. This article is a [stub]. You can help xmswiki by expanding it. This page was last edited on 10 March 2017, at 17:37.